Desalination – Solar Seawater Still (SSS): Water is a precious resource especially in dry areas. In hot and dry areas the sun provides the heat for evaporation. On the right can be seen a diagram of a seawater still, that distills fresh water from salty seawater. Explain how a Solar Seawater Still works! Analyse the background of Solar Stills and suggest improvements to the setup (e.g. fresh water collector directly under the seawater container). Measure temperature differences in soil according to depth (underground). If the temperature difference is high between surface temperature and depth of fresh water collector condensation works better. Try to build your own Solar Still and collect data about the amount of fresh water retrieved from the SSS per hour with certain environmental conditions. Upload snapshots about your Solar Seawater Still (SSS) on Wikiversity and explain how you collected data with your experimental design. Look for areas on the globe, where your Solar Seawarter Still could be applied (availability of seawater, not enough or contaminated freshwater, temperature conditions). (Windpump and Seawater Transport) With wind energy sea water could be transported from coastal areas to hot arid zones, that have no direct access to seawater. Analyse possibilities of transporting sea water to hot desert regions on the globe. Does that extend the geographical areas of application for your SSS? Create an SSS application map with OpenLayers, which shows areas on a heatmap where the areas in red are the hot areas which can benefit from Solar Seawater Stills. 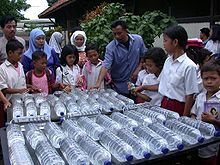 (Solar Water DISinfection SODIS) Compare the concept of an Solar Still with Solar Water Disinfection! What are similarities and differences between those concepts? Analyse the chemical and physical properties of water and explain why they are relevant to the comprehension of the Solar Water Still. Study the effects of water on life. The Solar Water Still is just one method to provide the necessary water for life. What other sources of water exist to allow plants and animals to survive? Where is water necessary in the life cycle of plants and animals? Explain in detail according to biological background knowledge! Water pollution of different types create a risk for human, animal and environmental health. Learn about Risk Management and apply that to water pollution and health. Pharmaceuticals are helpful in health services, but it is also a difficult task to remove them from waste water (see also Water:Health and Pollution). Analyse the Solar Water Still in the image on right and try to explain why water can be considered as having been treated by the solar water still. Can this water be used for a greenhouse? Evaporation removes also minerals from the water, is that a problem for drinking and/or for plants? Look for scientific evidence and add the evidence to this article and create further questions to explore this area! Explain how to deal with the polluted sediments in the upper water container. Analyse the United Nations' concept of Sustainable Development Goals. A preliminary approach will provide two SDGs which seem to refer to water. Systems Thinking applied on the topic of water will lead to many more SDGs which are effected by water. 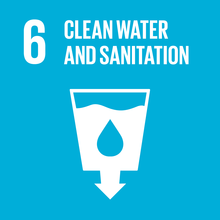 Try to analyse every single SDG and explain how water plays a role in the accomplishment of these goals. Extreme events due to climate change cause a higher probability of flood events. Flooding needs to be responded by disaster management. Capacity building will focus on modelling of flood events, planning response and preparedness activities and learning how space technology with freely available services (e.g. Copernicus) could support risk management strategies. Map of the Earth with a six-metre sea level rise represented in red. This learning resource focuses on how water is important for life on earth. (Water Resources) There is a lot of water on earth but drinking water is scarce. Determine the percentage of water available on earth, that can be used as drinking water. Analyse the over-exploitation of fresh water and link commercial exploitation of ground water to access to water for the local population. Link this analysis to the Sustainable Development Goals and explain for every SDG, if and how water supply is linked to this goals. Analyse the contamination of drinking water on earth. Explain sources of contamination of this precious resource -- drinking water. (Global Warming) An important fraction of drinking water (find out how much) is locked in the polar ice and ice in glaciers. Try to find out how much drinking water we might lose if global warming causes the polar ice and the ice in glaciers to melt. Perform a basic Risk Management for regions on earth which might be affected by a rise in the mean sea levels. What part of this coastal population, might this rise in sea levels, compel to migrate inland to higher ground? Explain the impact of water evaporation in the context of global warming. (Mapping of Risk and Resources) Water is a precious resource that is necessary for survival of flora and fauna on earth. Try to create heatmap by using OpenLayers and show where people on earth have enough clean drinking water. Mark areas as red if people do not have clean drinking water. Define semantics of the color scheme used in the heat map first and then try to find open data for creating such a map (see Spatial Risk Management and Water Resource Management). Why is this inorganic compound with the molecular formula H2O so stable? If you burn hydrogen heat is generated (Link History: Zeppelin Hindenburg at Lake Hurst) and the product is water. Why is heat generated? What lighted the hydrogen in the Zeppelin, so that water was generated? Why could the generated water not extinguish the fire in the exploding Zeppelin? You can generate water by using hydrogen and oxygen in a fuel cell. This electrochemical cell converts the chemical energy from a fuel into electricity through an electrochemical reaction. Analyse the chemical processes. How can this concept be employed for Electric Mobility? Analyse the quantity of water production and determine whether that concept will be able to produce water as a resource. Explore why water exists on our planet in such great abundance, in contrast to the far less quantity of gold! The answer to this question could lead, via modern Physics to the Big Bang! (Saline) Look at the Salines e.g. in France and combine the concept with Solar Water Still and analyse the economic impact in conjunction with fresh water supply in arid/dry zones. Rainwater harvesting system, 2003, Trinidad. (Rainwater Harvesting) Due to climate change extreme events become more likely. On the other side there can be location in the dry periods inbetween become warmen. Rainwater harvesting could be one approach to collect water during rainy seasons and use the water in dry periods. Calculate your own water consumption per day per member of the familiy (including drinks, washing, plants, ... and compare that with your estimates in a refugee camp. In dry zone the supply with clean water for a large number of people is a big challenge. Explore options to cover the need for water and analyse the methods of supply chain management! (Primary Schools) Explore water evaporation and condensation in a pot on a stove. This can be explored by a video recorded with a smartphone in the kitchen and shared/presented on a data projector in school. Pupils should explain what they observe. Use salty water in pot and condensed water. Taste of cold salted water should be compared with the taste of collected condensed water (taste the salt removal). (Secondary Schools) Explore physical and chemical properties of water according to evaporation and condensation (curriculum). Energy consumption of the stove. Refer to Solar Water Still and Green Energy. (Engineering) Optimize technical design of Solar Water Still. (Physics University) Modelling of Fresh Water production of Solar Water Still (Bachelor of Science). (Geography/Spatial Analysis) Where are solar water still necessary and applicable - create a risk map for fresh water shortage and resource supply map for solar water stills and integrate both. ↑ Wegelin, M., Canonica, S., Mechsner, K., Fleischmann, T., Pesaro, F., & Metzler, A. (1994). Solar water disinfection: scope of the process and analysis of radiation experiments. Aqua, 43(4), 154-169. ↑ Ternes, T. A., Meisenheimer, M., McDowell, D., Sacher, F., Brauch, H. J., Haist-Gulde, B., ... & Zulei-Seibert, N. (2002). Removal of pharmaceuticals during drinking water treatment. Environmental science & technology, 36(17), 3855-3863. ↑ Held, I. M., & Soden, B. J. (2000). Water vapor feedback and global warming. Annual review of energy and the environment, 25(1), 441-475. This page was last edited on 13 November 2018, at 15:39.